When introducing new technology in a 1:1 classroom, consider breaking the lessons and tasks into small increments with easily measurable products and goals. Author's Note: This post expands on ideas that I originally shared last year on Edutopia. 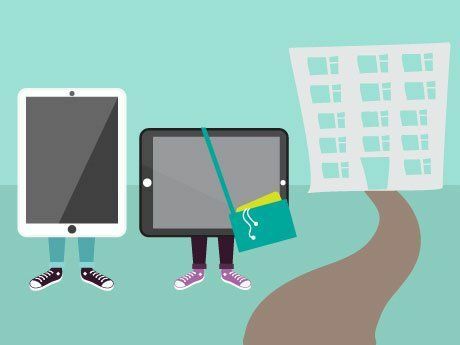 With the start of school approaching and the looming expectation of incorporating iPads into the curriculum becoming a reality, the big question many educators are asking is: "Where should I begin?" Last year, I wrote about 5 Steps for the First 5 Days. However, what about the five days after that? 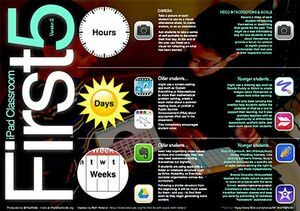 It can seem daunting to envision a year's worth of activities with iPads, but when taken in small chunks, it doesn't need to be intimidating. Taking a note from Alan November's talks about the #1st5days, consider what is possible in the first five hours, days, and weeks of school. Take a picture of each student to use as a visual attendance sheet, to create avatars, or as an icebreaker. These photos could be used for a Back to School slideshow or an end-of-year retrospective. 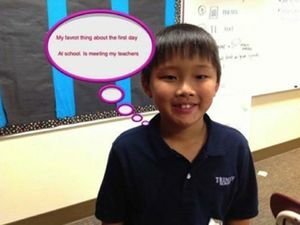 Ask students to take a series of self-portraits to document their first day. These images could be used in later projects or at the end of the year as a visual for reflecting on what has been learned. Record videos of all students introducing themselves or describing their goals for the year. This might be a less intimidating way for new students to talk about themselves or provide a forum for seniors or eighth graders to contemplate beginning their last year in your school. The pictures or videos captured during these initial activities could even be posted to a Padlet Wall to create a digital bulletin board. As an added bonus, your Padlet Wall becomes a great reference as you learn new names and faces during the first week. The power of the iPad is how it can be used as a creation device. This does not imply that students need to create massive projects right off the bat, but consider how they could leverage a few tools to begin demonstrating their knowledge and understanding. Older students might use a screencasting app such as Explain Everything or Educreations to show their mathematical problem solving, create a book trailer from their summer reading, or publish a public service announcement (PSA) about appropriate iPad use in the classroom. Consider what you could learn about your students' thinking if you could hear their voices and see their processes as shown in this screencast. Younger students might use a drawing app such as Doodle Buddy or Skitch to create images about themselves or share their initial learning. Not only does jumping into creation help students realize the potential of the iPad as a tool to support their learning, but it also provides teachers with an opportunity to differentiate assessment, scaffold skills, and learn more about their students. I think that those times spent at the beginning of the year learning how to use iPads are as essential as the time we spend going over how to choose a book, how to sit quietly and read, how to work cooperatively, etc. They are essential skills taught during the first six weeks of school that lay the groundwork for the months beyond. 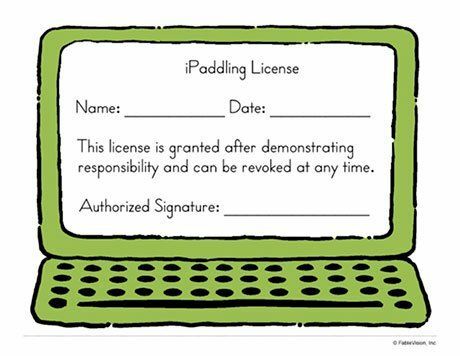 To provide her elementary students with a concrete representation, Suzy issues iPaddling licenses. 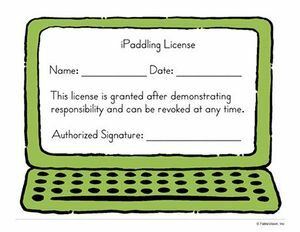 Much like earning a driver's license, Suzy's students must demonstrate a specific set of skills before earning the right to use iPads independently. At the high school level, Shaelynn Farnsworth (@shfarnsworth) gives her students a set of expectations. Rather than being a compilation of do's and don'ts, her list provides students with a framework for establishing classroom culture and touches on broader concepts such as responsibility, citizenship, and respect. 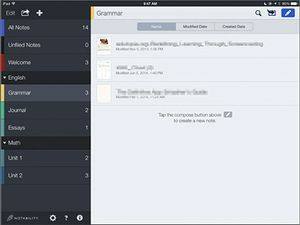 Bringing iPads into the classroom also raises numerous questions about organization and iPad workflow. Much like students need help organizing paper-based binders and notebooks, they may also need assistance sorting themselves out digitally. If students are using apps with a folder or notebook structure such as Drive, Notability, or Evernote, consider organization across the curriculum. If all of your students follow a similar structure from the beginning, it will be much easier for them -- and you -- to find their work as they begin generating more content. In addition to providing students with a consistent organizational scheme on their devices, consider a standardized naming system for files and projects. For example, Brenda Doucette (@doucetteb) teaches her middle school students to name all projects with the same format: section-lastname-project. While every teacher doesn't have to adhere to the same naming conventions, consistency does help students to transition between classes and keep you sane by preventing 50 nameless homework submissions! During the first weeks of school, consider setting aside a few minutes each day to teach specific iPad skills such as adding a web clip, using "Speak Selection," exporting to cloud storage, or configuring auto backups such as with Notability and Drive. Students may be comfortable with using iPads, but that doesn't guarantee that they'll know how to leverage all of the technical capabilities. As Richard Wells has masterfully illustrated above, the First 5s do not have to be an inundation of apps and tools. By breaking the process into manageable timeframes, and by focusing on a few core skills and experiences, the task becomes a little less overwhelming -- and a lot more exciting.